If you are considering one of the new mini laptop systems currently available you may be interested in this new comparison between the second-generation GPD Pocket 2 vs One Mix Yoga, which has been Kindly created by Brad Linder over on the Liliputing website for your viewing pleasure. Currently the GPD Pocket 2 mini laptop is currently available to preorder from the recently successfully completed Indiegogo crowdfunding campaign and is expected to ship sometime before 2019 end is currently priced from $529. In comparison the One Mix Yoga offers a couple of different features and is priced from $450 but is equipped with a slower processor in the form of an Intel Atom x5-Z8350 quad-core. 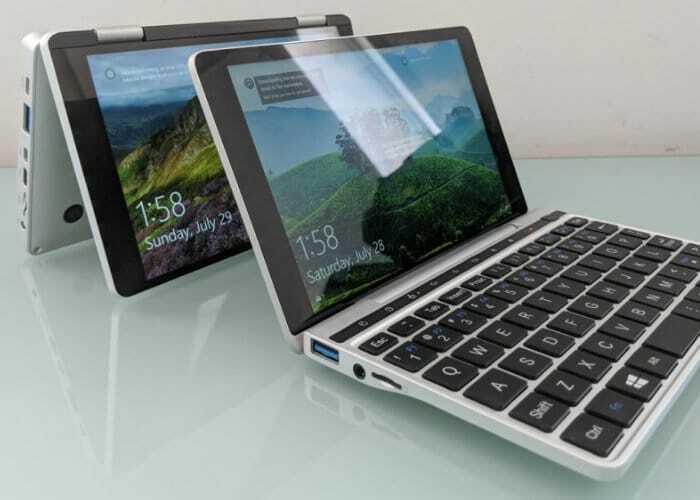 On the other hand the GPD Pocket 2 is equipped with a faster Intel Core M3-7Y30 dual-core processor. Full specifications are listed below for each mini laptop system. One Mix Yoga – 7 inch, 1920 x 1200 pixel IPS touchscreen display, Intel Atom x5-Z8350 quad-core processor, 8GB of RAM, 128GB of eMMC storage, micro USB port (for charging), USB Type-C port (for data), USB 3.0 Type-A port, micro HDMI port, microSD card reader, 6,500 mAh battery, Backlit keyboard, 360 degree hinge, Optional active pen with 2048 levels of pressure sensitivity, 7.2 x 4.3 x 0.7 inches in size and weighs 18.3 ounces. Jump over to the Liliputing website by following the link below For more information on the GPD Pocket 2 mini laptop.